I rose early to find Festim, my hostel host, readying breakfast for our merry band of backpackers. He made us all a delicious breakfast of coffee, that Albanian feta cheese I’m addicted to, tomatoes, cucumber, bread, and eggs to send us off. I broke bread with my fellow travelers I had met the night before in our hostel; an Aussie, a couple of Americans from Pennsylvania, and a Dutchman. I had almost finished my plate when Festim asked if I’d tried Albanian tea, and proceeded to prepare a glass for me. This traditional Albanian brew known as çaji i malit (chai-molly) or “mountain tea” has a rich, herbaceous flavor that is fantastic with a bit of honey. If it hits the international markets I imagine this will be the next quinoa. Festim suggested I could find it for sale in the markets. I would have to keep an eye out. After a goodbye and thank you to Festim I cycled back along the main road I had strolled down the evening before. It was still grand but without the proud carriage and fine attire of the night before. 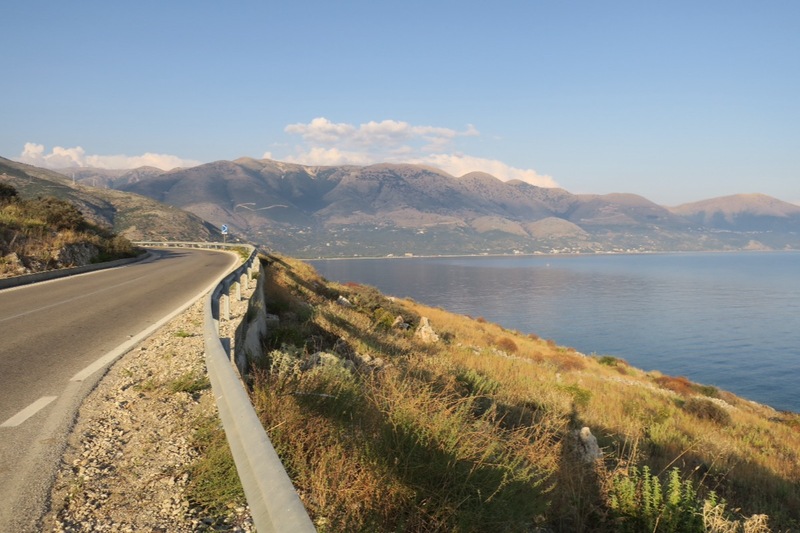 Once meeting up with the sea I cycled south along what is referred to as the “Albanian Riviera”. 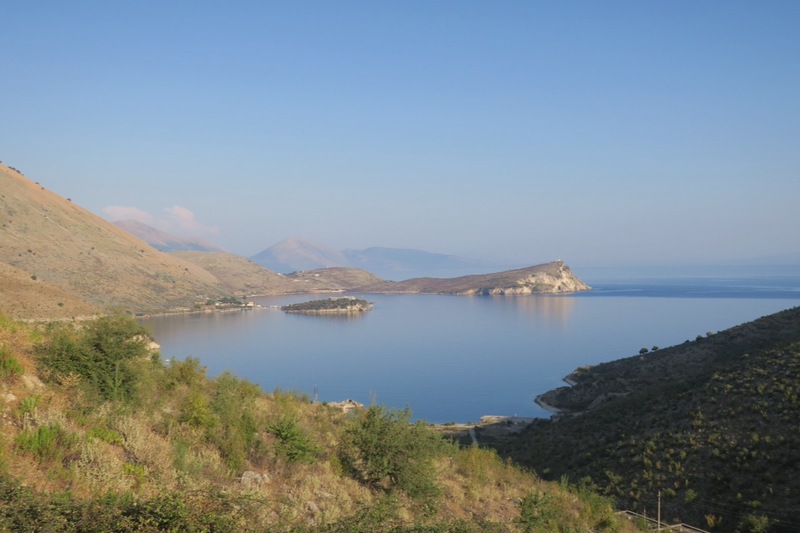 The past four days in Albania I had cycled inland for a direct route, as there isn’t a continuous costal road. This morning I was happy to have the beautiful Med as my companion once again. 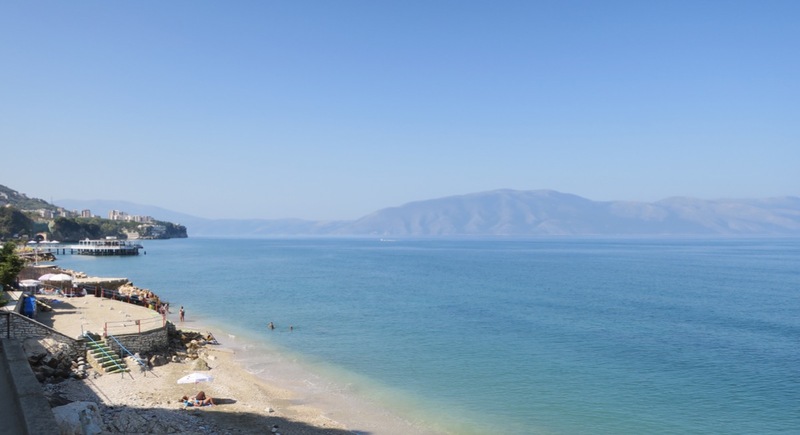 As it turns out, the incredibly clear water of the Balkans continues in Albania. 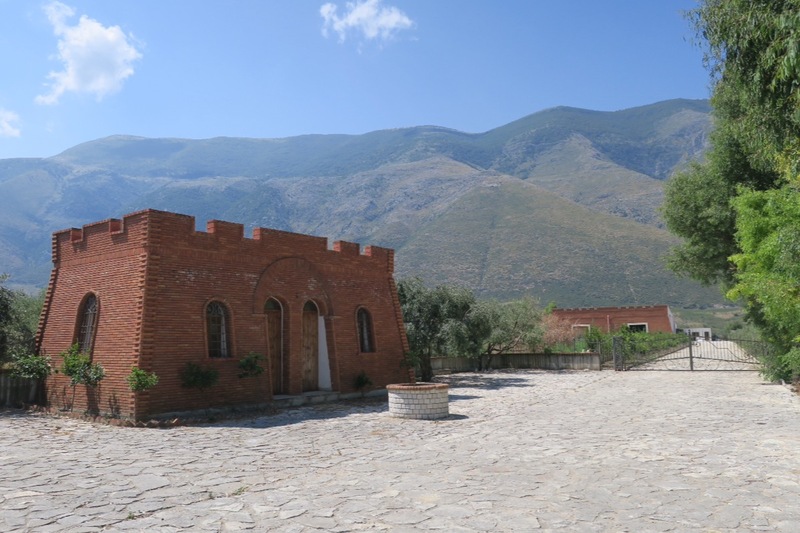 In contrast to Croatia for example, the tourist infrastructure is just picking up speed and photo marring construction seemed to be everywhere. Heavy machinery dotted the coastline and newly built but unfinished apartments were a common sight along the coast. My course veered off the coast and I was again surrounded by farmland. Soft green fields stretched out around me and in the distance I could see the abrupt blue outline of what I would be crossing today. Today promised to be a challenging day of cycling. About a third of the way into my cycle the hills began in earnest. It was already incredibly hot and I longed for trees to ease the effects of the baking sun. It didn’t take long to realize that I was not alone on these roads. Horses, cows and mules were frequently next to, on, or in the middle of the highway. The strategy here was not to fence livestock in, but to give them all loud bells. It was actually a comforting sight to see cows ambling along the highway. If the cars are used to dodging oblivious cattle, then avoiding this brightly colored cyclist should be no problem. For the remainder of the day I would often hear animals before I would see them. For once, we didn’t need more cowbell. 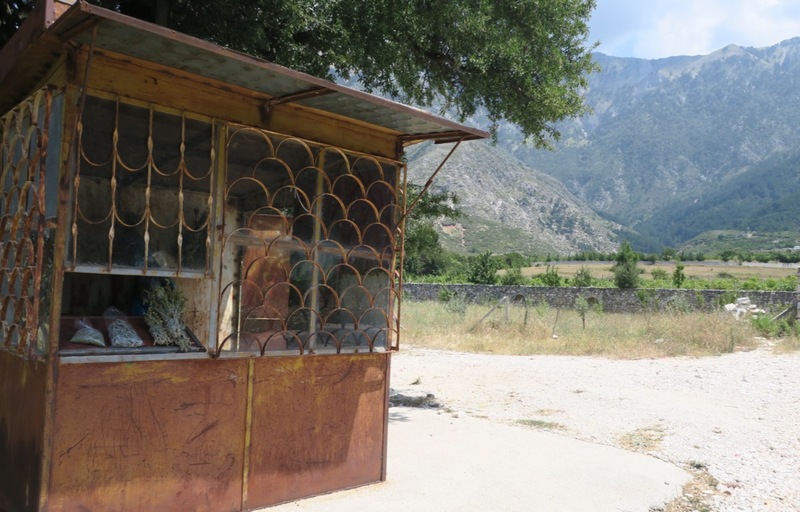 Tiny stands along my route began appearing, most of them selling jars of golden honey and bunches of çaji i malit. So much for going to a market. What better place to buy mountain tea than in the actual mountains? I stopped at one such stand and bought 100 lek’s worth (about $0.82 USD) which I carefully stashed in my pannier. I’m not a big shopper when I travel. In fact, aside from my gifted Albanian shirt and a few postcards, this tea would be my only souvenir from the trip. A little while later breathless and sweating beyond what is reasonable I rounded a bend and saw a restaurant. It couldn’t have come at a better time to stop for something cold to drink and refill my water bottles. I lingered for a while in the shade taking in the view and what I had traversed thus far. As I was getting ready to leave I spotted a man in cycling gear. Comrade! 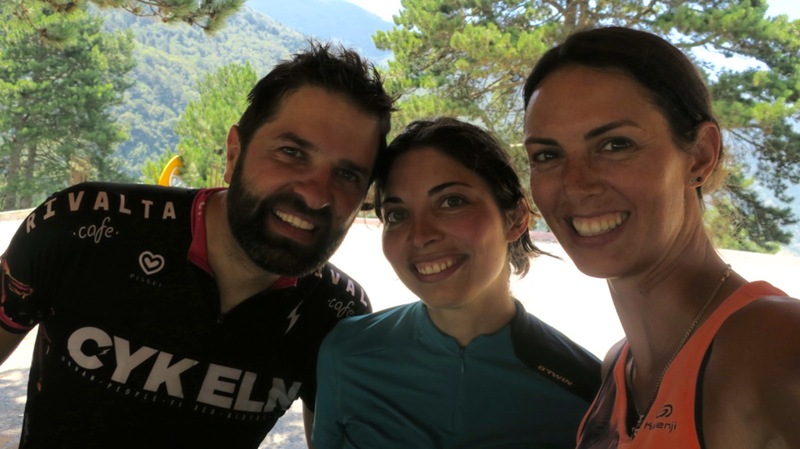 Francesco and Ilaria were both from Italy, and had taken a ferry over for a ten-day cycle around Albania. We compared travel notes and shared a few road stories. I also admired their ultralight panniers. 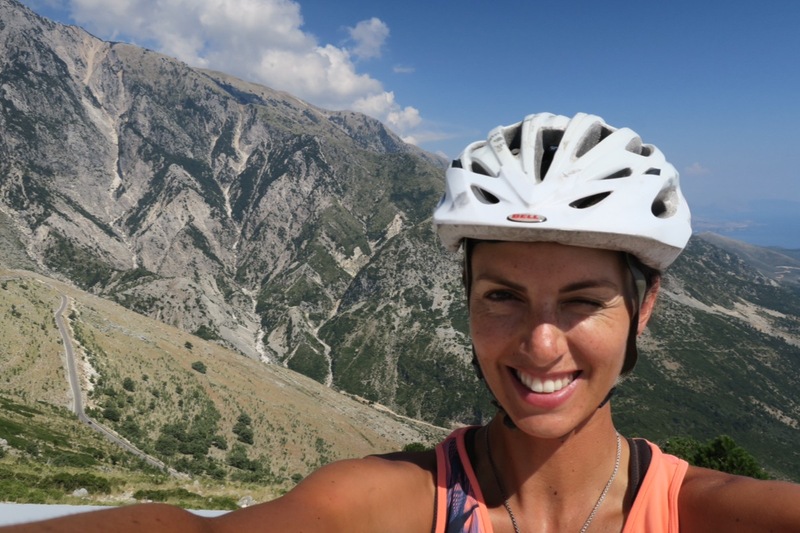 They were the first touring cyclists I had laid eyes on in Albania, and what a spectacular day to meet them on. As Ilaria said, “It is nice to know someone else is crazy enough to do this too!” By “crazy” she meant the pass we were all working our way towards. We said our goodbyes and I carried on; back into the fray of heat and inclines. But today wasn’t just any day of climbing. Today I would be crossing Llogara Pass. 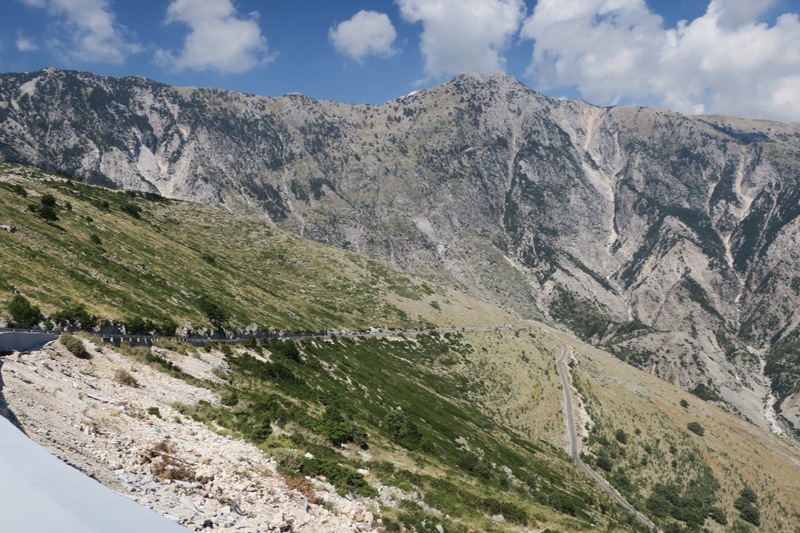 An aggressive pass in the Ceraunian Mountain range, online searches had brought up phrases like “the landscape goes wild” and “it’s steep but I’ve seen cyclists make it”. My host Festim had said “if you have to cycle it, you’re going the best direction”. I was braced for a challenging day of cycling, but I knew one way or another I could do it. One pedal at a time. I had fought my way up yet another round of switchbacks when I spotted another restaurant. It was after 2:00pm and I really needed to eat. I pulled up next to a small group of patrons. “You are brave!” Said a smiling woman about my age. “We saw you cycling earlier and are very impressed!” We quickly fell into conversation. She was from Estonia, her husband Albanian, living in Switzerland but they came here for a vacation with her parents. 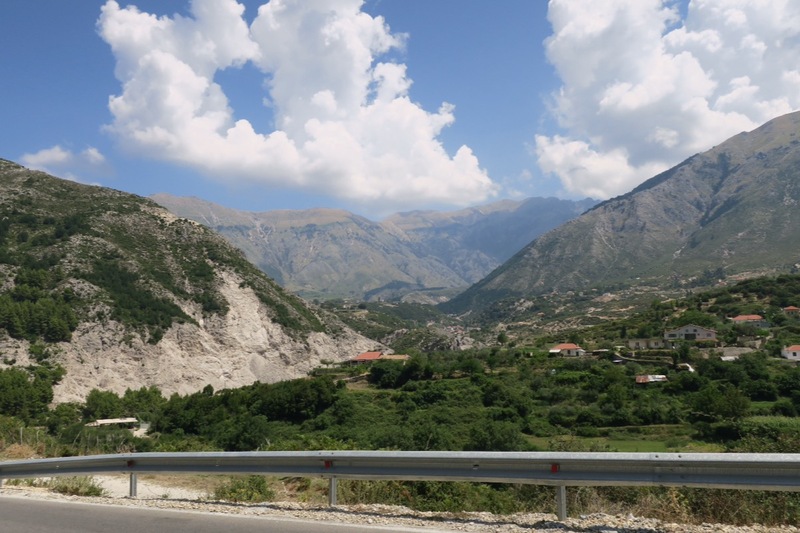 We chatted for a few moments about the beauty of Albania. Her husband, a tall striking man, added “the people here don’t need much, they come from Communism. 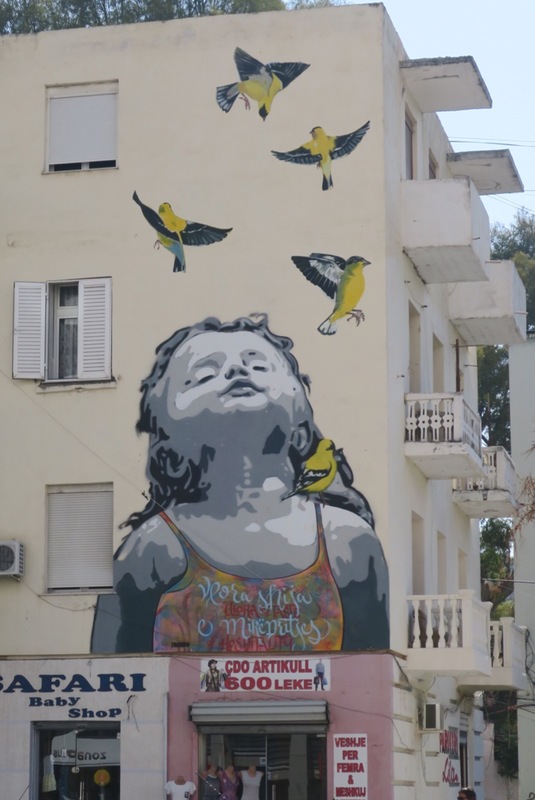 Even living in a capitalist country, I never want to lose that part of myself”. I instantly loved this family and wished them a wonderful vacation. I had a fantastic lunch overlooking the progress that I had made. Roasted lamb, yogurt with walnuts and honey, and an iced tea absolutely hit the spot. In an extra show of hospitality I was given slices of juicy watermelon. I had a heartfelt conversation with my waiter, who was probably 18, about travel and nature and how every place has its own beauty. He said he loves talking with the travelers that pass through the reastaurant because he learns things about their countries. He is also deeply concerned about his beautiful country being destroyed for the pursuit of money. I didn’t have any answers for him, but I was moved by his caring. With the immense hearts and sharp minds of the youth I have met while in Albania, I hope they can help shape a more prosperous yet authentic future for this country. I was at the top before I knew it, and I let out a warrior cry. 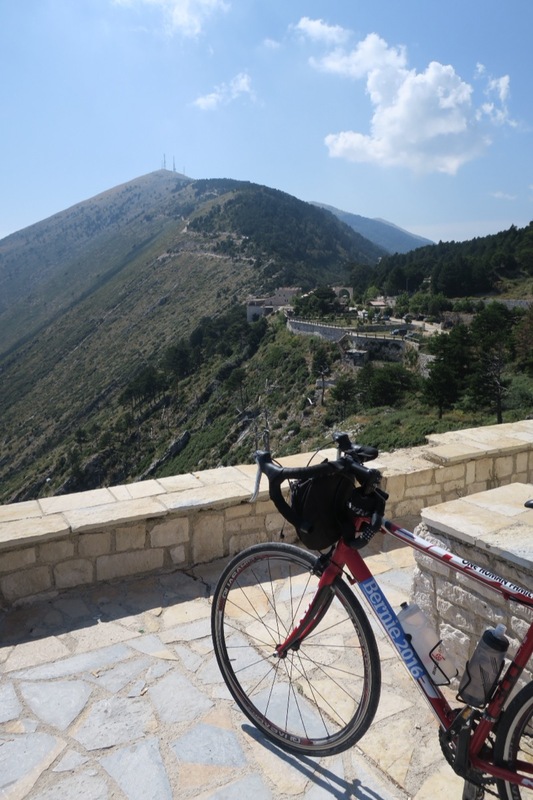 Perched at the apex of Llogara Pass I had cycled from sea level to 3,422 feet. It had taken six hours, but I felt energized from the immensity of it all. I cycled around a bend and the sky opened to the ocean below. The mountains on this side of the pass were even more striking. Immense, swirling curves in the road carried me down from the pass. 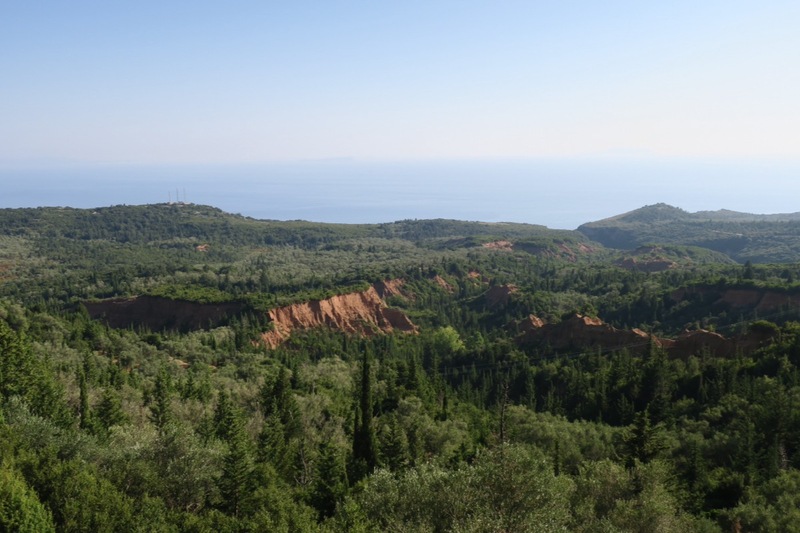 I understood now why Festim had said cycling the other direction over Llogara Pass would be harder. 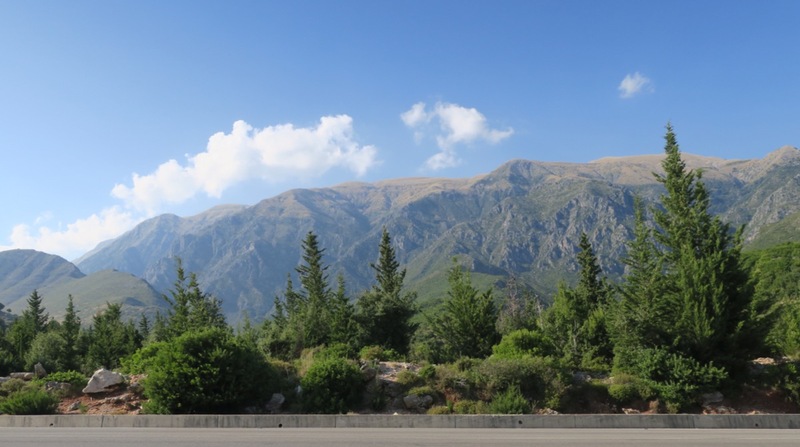 I cycled down the winding highway hugging corners and my brakes as cars passed. Some motorists looked confused by my presence. Others shouted their approval. I don’t think cyclists were tackling this route every day. I coasted until I swear I could smell my brakes burning and my arms ached from keeping my speed in check. It took a couple quick breaks to get me through the long and unrelenting descent. It’s funny how the mind plays tricks on us. 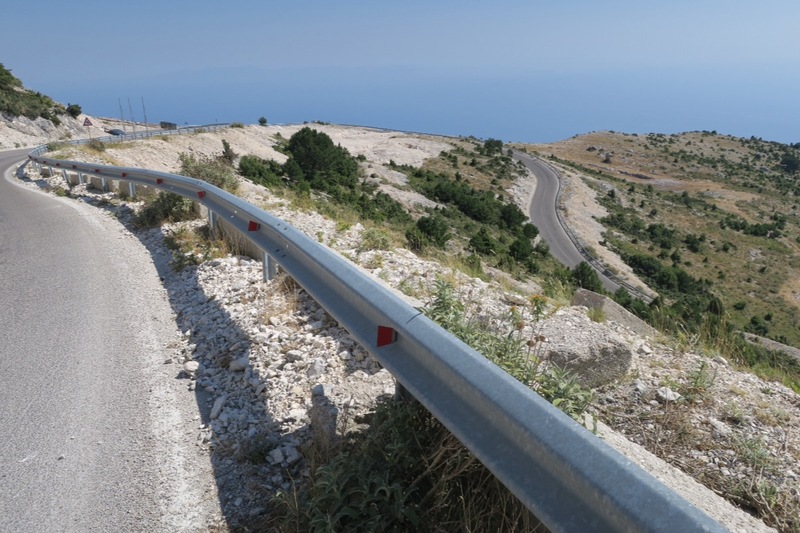 At this point having crossed and descended from the pass I was mentally prepared for an easy coastal ride the rest of the way to my destination of Borsh. But this was definitely not the case. I may have crossed the pass with its own Wikipedia entry, but there were many more inclines to take on for the next 20 miles. I fought my way up hot, shadeless hills. 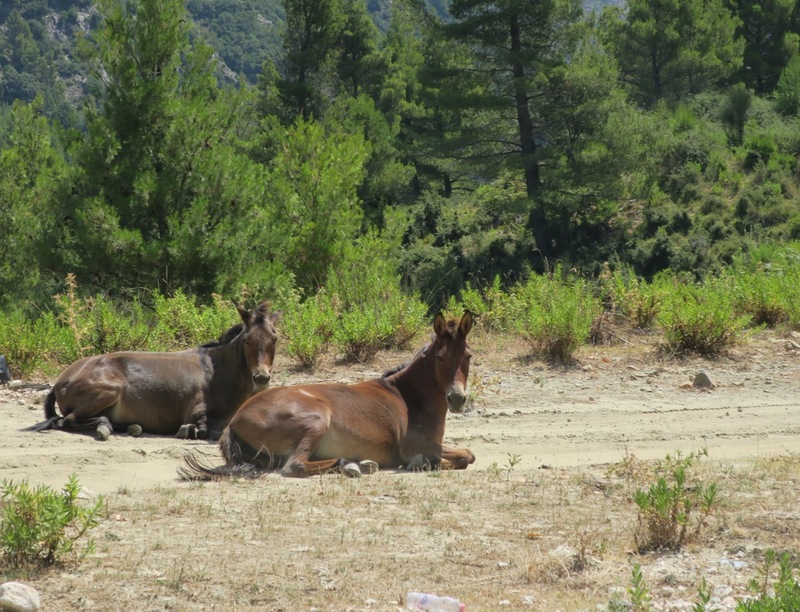 In total I must have seen twenty 10% grade signs after Llogara pass. 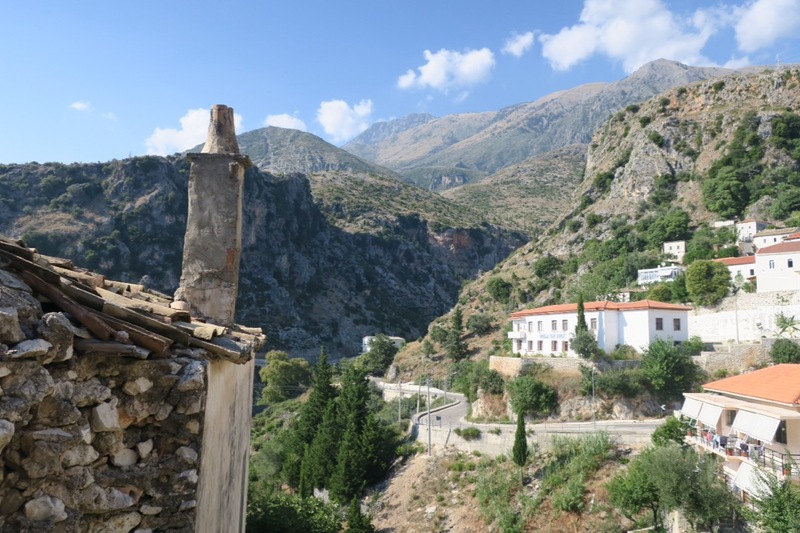 At one point I looked up to see such a steep road that I muttered “f-that” under my breath and pulled off at a kafe to drink something cold and recharge. When I got back to tackling this incline I stood on my pedals and used every bit of muscular strength, weight and momentum to launch myself over it. Had I stopped I would not have been able to start again. The next town I came to I started having some unscrupulous thoughts. You can just stop and stay at this town. You can cancel your reservation in Borsh. Oooh! A sign for a hotel! Let’s stay here Alexa. I had to have a serious talk with this weaker part of myself and an out loud pep talk to shed these thoughts and keep pedaling. I had set out to cycle 57 miles to be within sane cycling distance to catch an early ferry in the morning. 57 miles was what I was going to do. Not long after my episode of internal struggle and I was confronted with a road block. Two herders were encouraging a herd of cattle across the highway. When a gap opened I cycled slowly through, making a wide turn to herd a stray calf back toward the group. The tan and white beauty looked at my bike wide eyed and headed back in the direction of mum. The herder nodded his approval. Soon after I was reunited with the sea, at the Bay of Porto Palermo. The sun was starting to soften and the water took on a mirror-like quality. 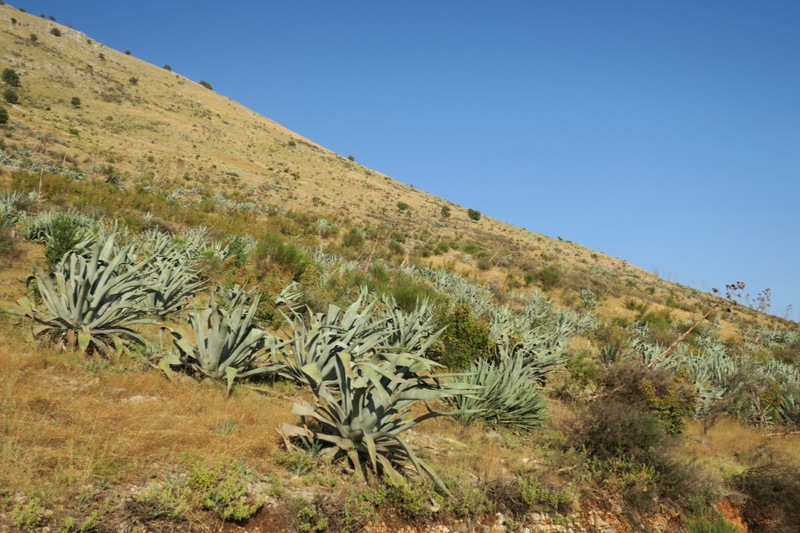 Suddenly the hills were covered in what turned out to be agave plants. Every so often I would spot one of the mushroom-like bunkers which were built between 1967-1986. 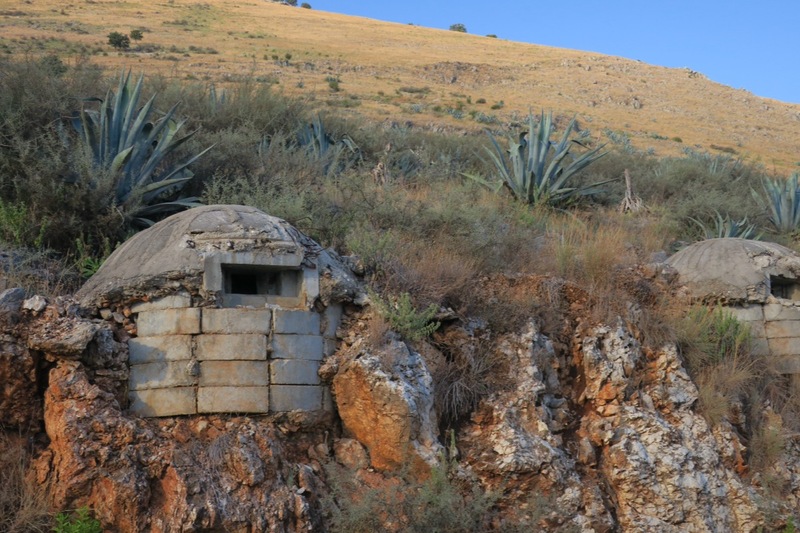 It’s estimated that over 700,000 bunkers were built within this period, although they were never used for their intended purpose. I cycled through one more small town and could have cried when I saw the sign for Borsh. 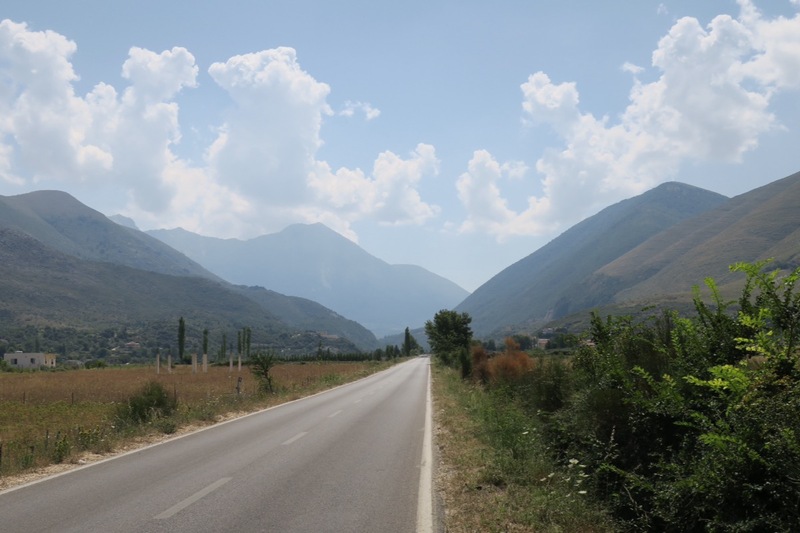 This was my last full day of cycling and Albania could not have given me a more mesmerizingly beautiful, challenging or heartfelt 57 miles. I feel like every other cycle of this journey had been preparing me for this day. In return for my buckets of sweat I had received honks, waves, fist pumps and words of encouragement from motorists. It was overwhelming. Spine tingling, throat tightening, soul soaring overwhelming.